Mikaela Shiffrin celebrates after winning the giant slalom World Cup in Squaw Valley on Friday. On Saturday, she competes in a World Cup slalom. OLYMPIC VALLEY, Calif. — Tamara McKinney is a member of an elite group — she’s one of four Americans who have won an overall World Cup title. McKinney soon may be welcoming one more to that club. Here at her home mountain, McKinney watched on Friday as Mikaela Shiffrin moved closer to achieving that goal. McKinney won the overall title in 1983. The only other Americans to have won the title are Lindsey Vonn (2008-2010, 2012), Bode Miller (2005, 2008) and Phil Mahre (1981-1983). The word “amazing” was the most common superlative for Shiffrin, who now holds a 278-point lead in the overall with her win Friday. 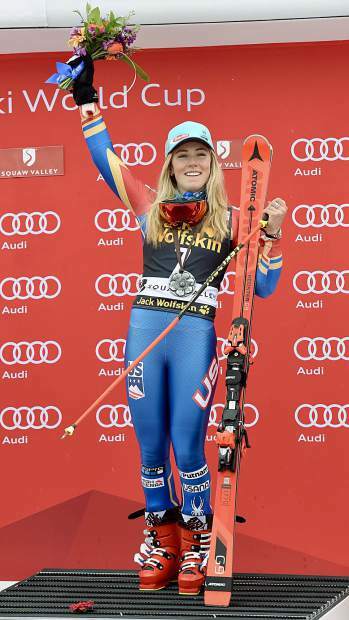 This year, she has six wins in World Cup slaloms, three in giant slaloms and one in alpine combined. She also won a gold and a silver at the FIS Alpine World Ski Championships in St. Moritz, Switzerland. At the same time, everyone wants to beat her, Gagnon said. “And if you do, and she skis well, you know that’s a huge accomplishment,” she said. Ceil Folz was the chair of the organizing committee of the 2015 Alpine World Ski Championships in Vail and Beaver Creek and has known Mikaela for years. Folz — who is in Squaw Valley consulting for the organizers — said that Shiffrin is on track to be one of the all-time greats. Shiffrin will continue her quest for the overall here in Squaw Valley and next week in Aspen. If she achieves it, the title will truly be something special, McKinney said — something different from Shiffrin’s Olympic and World Championships golds, but significant in its own right. “To be the best in the world with all of your peers through the 40-some races is huge,” she said. Just 23 men and 28 women have claimed the overall title since the World Cup began 50 years ago. “To be in that small group of the best in the world over 40-some races, that takes something real that is bigger than just having a flash in the pan,” McKinney said.